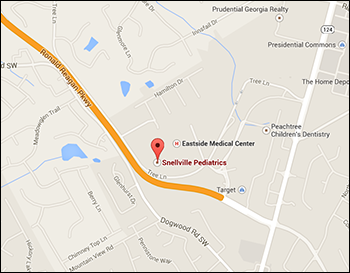 We are conveniently located at 1700 Tree Lane, Snellville GA 30078 in the medical professional building located on the Emory Eastside Medical Center campus. Our offices are located on the first floor of the Physician’s Building in Suites 110 and 150. When you call to schedule an appointment, you will be directed to the appropriate suite for your visit. In addition to current patients, we welcome new patients to our practice. We also encourage expectant parents to contact us for information on our pediatric practice prior to the birth of their child. If you are a first-time patient, please arrive 15 minutes early to complete your patient forms on a tablet. Also bring your insurance card and your child’s immunization records to that first visit. Any minor must be accompanied by a parent or legal guardian. We understand the need for a child to be seen on an urgent basis and we will do our best to have you seen as quickly as possible. Walk-in urgent cases may be assessed by a member of our Triage Team. One of these trained staff will assess the situation and arrange to have your child seen by one of our providers. This may be a physician or one of our pediatric nurse practitioners. Kids Time Pediatrics – with several convenient locations, Kids Time Pediatrics is open for sick children on weekdays from 6pm-9pm, Saturdays from 10am – 5pm, and Sundays from 1pm-7pm. With most insurances, you will pay approximately the same amount you would pay at our office. Children’s Healthcare of Atlanta Urgent Care Center – with multiple locations, CHOA urgent care centers are usually open from 11am – 9pm on weekdays, and 9am-9pm on weekends. Wait times are often long, and many insurances require a higher copay for visiting an urgent care center. Children’s Healthcare of Atlanta Emergency Departments – with locations at Scottish Rite, Hughes Spalding, and Egleston – CHOA emergency departments are open 24 hours a day, 7 days a week, 365 days a years, and are the best place for seriously ill children to be evaluated. Wait times can be very long and visits to the Emergency Room can be very costly for families. For after hours locations, please keep in mind that business hours are subject to change at any time. Please call the appropriate office before your visit to make sure they are open. Additionally, not all insurances may be accepted at each location – please call in advance to make sure the office you select participates with your insurance plan.